The crisp fall weather is starting to roll in and both the NCAA and NFL football seasons have begun–I love this time of year! To top things off we also have a quarter-ending month for our dividend portfolios, which for most in the DGI community tends to be their strongest months. I’m a bit of an outlier there as my mid-quarter month is my strongest when looking solely at my new DGI portfolio. Which brings me to another point–moving forward, I will be including the dividends from my retirement accounts in the monthly dividend income report despite not referencing the index funds in the DGI portfolio. With the addition of my self-made mini-REIT ETF being in an IRA, I have expanded the DGI portfolio beyond just the taxable account and therefore I thought it would be fitting to look at the full picture. 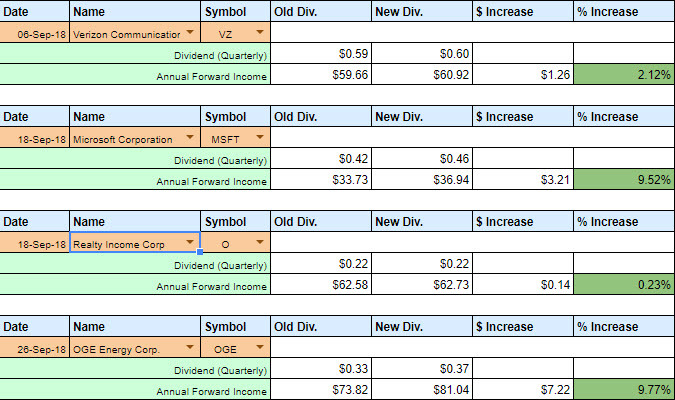 When I shared the last quarter-ending dividend income report, there were 9 stocks that were not included in the report because I had purchased after the ex-dividend date. I’m happy to report that those stocks are now included and that has helped boost up my results. The month of September has brought in a staggering $1,386.02 in total dividends! Looking purely at the DGI portfolio, you will see that the total here is lower than my August dividend income report and based on forward income projections the mid-quarter month continues to be the best from a DGI perspective. The 76% YoY growth is extremely encouraging particularly when considering the two retirement funds, VTSAX and VFIAX, do not have new capital being added and that growth is purely from the power of dividends. That growth alone was a robust 29% and then all of the new DGI holdings that did not exist in 2017 brings me even farther up. It is encouraging to see that my Johnson & Johnson dividend more than doubled since June due to additional purchases, and the multiple purchases of Cummins has resulted in a nice payout as well. Last but not least, we will see another boost to the quarter-ending months once all of the REITs that were recently purchased begin to payout. There are 5 REIT holdings that will payout in September that aren’t included here. With the DGI dividends being reinvested (exception being VTSAX due to preparation for a portfolio change in my taxable account) the portfolio added an additional $9.87 in forward dividend income. Other than my flurry of activity in establishing my own REIT ETF, September was fairly quiet in terms of purchases. This was due to the lack of buying opportunities across my current holdings resulting in a dip down to $1,771.20 in new capital being added. The two purchases of Cracker Barrel added 12 shares to my portfolio at an average price of $147.60/share. These 12 shares will add an additional $60.00 in forward dividend income. Having the good fortune to receive this pension rollover, I was able to add an additional $1,077.60 in forward dividend income. That provided a super-charged boost to my portfolio, which now stands at $4,809.00 in forward dividend income. There is definitely risk in having such a significant portion of my dividends coming from the REIT sector; however, as I largely will not be adding funds to that rollover moving forward, I expect this to balance out over time. There were four dividend raises that I received in September, which is a decent number considering that many of my holdings announced raises earlier in the year before I established my portfolio. Unfortunately there were not any double-digit surprises this month as all four increases were in the single-digits. However, as the great guys over at Dividend Diplomats always say, every dollar counts! Realty Income typically has minuscule raises given that they tend to raise multiple times throughout the year, and Verizon remained steady with their standard ~2% raise. On the bright side, both Microsoft and OGE Energy Corp. announced raises just shy of 10% each. The four dividend raises combined have added an additional $11.83 in forward dividend income. While that isn’t as nice as the $26.57 received from Altria alone last month, it surpasses the amount added from reinvested dividends–and emphasizes the importance of the three legs of the DGI tripod: dividend reinvestment, new capital, and dividend raises! Lastly, there were some raises announced of new holdings, such as W.P. Carey, that were made just ahead of my purchases. While I haven’t recorded those raises, I will definitely reap the rewards as they begin to pay out. By combining the dividends received from the index funds in my retirement accounts with my DGI portfolio, I sailed right by the $1,000 mark and set an overall new record. Taking a look at just my DGI portfolio alone, the results in September trail what I received in August but is still a great number on it’s own. The addition of the REITs to my portfolio has increased the overall portfolio yield, which now stands at a healthy 3.15% as of the end of September–up from 2.75% last month. The above table details that there was $9.87 in forward income from dividend reinvestment and $11.83 from dividend raises for a grand total of $21.70 in forward income that required no effort on my part. I would have had to invest an additional $688.31 in new capital at my average portfolio yield to equal that amount of forward income. Talk about motivation! Note: Due to rounding of numbers in my spreadsheet, the calculations above aren’t exact but are close enough for my purposes. 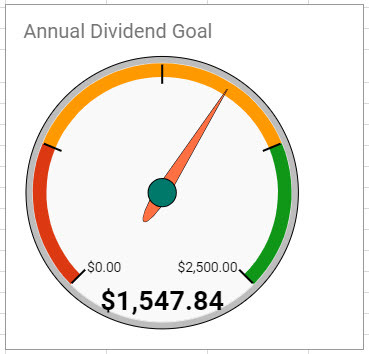 The September dividends have pushed me closer to my 2018 goal and I am now less than $1,000 away from reaching my target. With the addition of the REITs this past month and the payouts beginning to roll in here in October, I am confident that I will reach the goal but there is little margin of safety. To mitigate that, I am continuing to add new capital and am hopeful that the market will provide some attractive prices to make more purchases over the last quarter. The opening month of the new quarter is definitely my quietest month. However, by continuing to add new capital and reinvest my dividends, I am looking forward to a nice increase compared to June. With the holistic view of my dividends, I am ecstatic with the results in September but even more so by what the future holds! Amazing to see your results in such a short amount of time. Crossing the $1k mark in monthly is like one of the holy grails in FI. Thanks Mr. Robot, really appreciate that! I’ve definitely been fortunate to have had that nice lump sum to jump-start my portfolio, and to be able to continue adding a healthy chunk of capital on a monthly basis. Thanks Tom, and you’re right that Q4 is often an exciting time with the increased pay days closing out the year! I cannot wait to see what the DGI community produces in December! Nice dividends received this month divvydad. Over $1k in dividends definitely is impressive. I have no doubt at this rate you will hit your desired target. Keep up the amazing job! I will hopefully be getting my September dividend post up soon. Next year’s goal is going to include the index fund dividends, and I am going to be swinging for the fences for sure! Look forward to reading about your monthly results! Wow, DivvyDad! 76% YOY growth is incredible with your capital base. This is when we really get to see the impact of dividends in action. Keep the dividends rolling in! Thanks Kody, that YoY is certainly skewed right now by the influx of capital that I’ve had this year due to that lump sum I received but it is still exciting nonetheless! Things will level out next year but I will be working my tail off to keep it as high as possible! Woah! 76% YOY and over $1,300!!! Congrats on a terrific month Divvy Dad! WHOA WHOA WHOA, slow down there big guy, joking. Just impressive across the board, almost $1.4K and an 80% div growth from last year? Fricken kidding me? Just staggering. Love the dividend raises. Finishing this 4th quarter strong will be fun and glad you’re a part of the community. Haha, I have no plans of slowing down! Admittedly I feel as though I am cheating a bit by including the dividends from my index funds, however as I look to the long-term goal we will use the dividends from all sources so I should be tracking that. I really appreciate the kind words Lanny, I am thoroughly enjoying being part of the community and look forward to an insane Q4 for everyone! Those are some outstanding totals for just a few months of work. Congrats! Q4 should be even more impressive as those recent purchases start delivering some more dividends. It looks like $5K in forward dividend income is very attainable by year’s end. 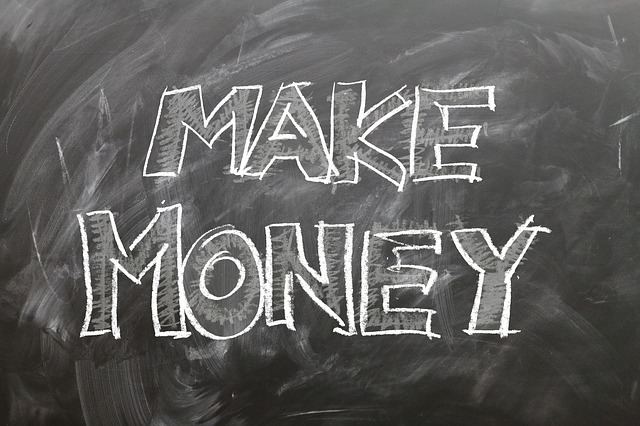 Do you have a year-end target you are trying to achieve for forward dividend income? I know you love it, though. As I mentioned to Lanny, I feel that I may be cheating a bit because the lion’s share of this amount is coming from my index funds that have been built over a number of years vs. the few months since I started the DGI portfolio. I am trying to hit $5k in forward income on the DGI portfolio, as I haven’t included those same index funds into my spreadsheet (which I am torn on doing). Great report DivvyDad. Interesting decision to report on your dividends in your retirement account and one that I fully support. Congratulations on sailing right past the $1000 mark. That’s very impressive. I do have a retirement account, but unfortunately, at least with respect to my Roth IRA, I only have one index fund. For my Roth 401K, they are all funds and so I don’t get the benefit of reporting on those dividends, as I like to only concentrate on stocks for my dividend portfolio. It’s nice because I sometimes forget that I have retirement accounts. I tend to look at my dividend portfolio as my retirement, which is rather silly given that I have other accounts. Maybe one day I’ll be in a position to include individual stocks in those accounts. Thanks DP, and I was definitely torn on including the index funds as I’ve been more focused on individual companies. However, as it pertains to my long-term goals of having dividends be a major supplement to our retirement income–or possibly even be able to fully live off of them–I felt it was prudent to include. Awesome results! The Y/Y growth is impressive and the pension rollover is sure to help next year too! Thanks for the feedback, and I am really looking forward to next year as I start reaching the point where I have held all of these positions for 12+ months! What more is there to say, other than INCREDIBLE! Lanny told me you crushed it this month. I had to come see it for myself and wow. Just wow. Thanks Bert, I really appreciate the feedback! Doing my best to make every dollar count and keep this snowball rolling! Congrats on a great month! You’ve been part of this community only for ~half a year but you are crushing it already! It’s nice to see how your journey is happening and how much progress you made already. P.S. we are sharing O and XOM this month. Thanks BI, I appreciate you stopping by and sharing your feedback. It has been exciting and the DGI community has been amazing and extremely supportive. Happy to hear that we are fellow shareholders in a couple of positions! Awesome results, Divvy Dad! A 4 digit month of passive income is staggering. And that’s an impressive year over year growth rate too. Thanks for sharing the detailed report and charts. Keep it up! Thanks RTC, appreciate the feedback! Happy to hear that you liked the report and charts! You sure that ain’t a typo? Almost 1400 dollars a month? Kidding aside, congrats my man! That is just fantastic. Haha, thanks TI. Appreciate the feedback! Wow you killed it this month and you got great dividend payers that will really help out in the future. Notice you bought some Reits I love them some have become real bargains. It’s tempting to load up on them. Keep it up. Thanks Doug, and you’re right about the REITs. I recently bought a nice collection and I am in the process of shifting a few things around that should give me an opportunity to add to some of them at slightly better price points after last week.